Beethoven's symphonies are among his greatest works -- in the opinion of many, the greatest orchestral compositions in the history of music. Perfect in their fusion of emotion and form, filled with drama and great beauty, they are among the best-known and best-loved works in all classical music. 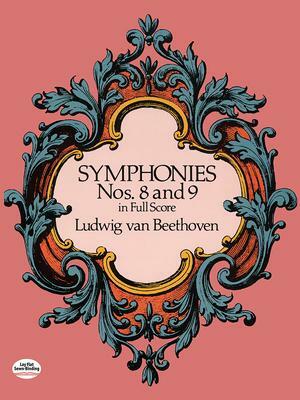 This volume contains complete scores for Symphony No. 8 in F Major, Op. 93, and Symphony No. 9 in D Minor, Op. 125. The eighth is full of beauty and innocent merriment, while the ninth is Beethoven's best and greatest symphony, a dazzling end to his symphonic works. Also included here is a translation of the passage from Schiller's ode "To Joy," featured in the last movement. Meticulously reproduced from the authoritative Litolff edition, each score features large, clear noteheads and wide margins for ease of use in studying and following the music. Far less expensive than comparable full-score editions, this volume belongs in the library of any music lover who wishes to study the masterly innovation and creativity Beethoven brought to the symphonic form. Beethoven's symphonies are among his greatest works--in the opinion of many, the greatest orchestral compositions in the history of music. Perfect in their fusion of emotion and form, filled with drama and great beauty, they are among the best-known and best-loved works in all classical music. This volume contains complete scores for Symphony No. 8 in F Major, Op. 93, and Symphony No. 9 in D Minor, Op. 125.